The best part of the original game, also done well in Star Control II, is the combat. Each round of fighting pits 2 ships against each other in a battle to the death. Each alien race has their own ship design, each varying wildly from the others. As you play, you see an image of that alien race manipulating its controls as you press each button, which I always found amusing. Each ship has two resources they must draw on: crew, and energy. Crew is the number of crew members left on board. These are basically used as hit points for the ship. The energy is what is drawn on for most of the weapons systems (with a few exceptions). Except for one or two exceptions, crew do not regenerate, so once you lose a crew member you can never regain that. Energy is depleted by a specified amount each time a weapon is fired. Different weapons require different amounts of energy, and each ship type regenerates energy at a different rate. In addition, each ship has a different mass, acceleration, and top speed (though that speed can be exceeded by using gravity slings, more on that later). Even before I knew how to write, I enjoyed storytelling and using my imagination. My brothers and I would play pretend and create strange worlds and characters. Super-powered robots, friendly mummies, Neanderthal side-kicks, the grim reaper. Then, in 4th grade, I wrote my first short story, and I loved the experience. So on the one hand, I’m a writer because I love writing. On the other hand, I want to do what I can to affect people positively. And I might as well have a good time doing that. The Absent Willow Review 2009 Anthology is Here! The first annual Absent Willow Review Anthology is now available here. You can learn more about The Absent Willow Review at their website. Also, in the interest of full disclosure, you will be able to read my story, Normal, in their January 16th, 2010 issue. Be sure and check it out! The Lost Treasures of Infocom is a package of 20 Infocom games that was released in 1991. The collection was released by Activision, who had closed Infocom, then their child company, back in 1989. The games included are Zork 1, Zork 2, Zork 3, Beyond Zork, Zork Zero, Enchanter, Sorcerer, Spellbreaker, Deadline, The Witness, Suspect, The Lurking Horror, Ballyhoo, Infidel, Moonmist, Starcross, Suspended, Planetfall, Stationfall, and The Hitchhiker’s Guide to the Galaxy. We performed our super-secret giveaway ceremony. I can’t tell you too much, but it involves both names and hats. And we can now declare a winner! Congratulations, Cat Barth! Your autographed book will be in the mail as soon as humanly possible. The face of “Horror” has changed. It takes more and more to scare us. For a while Hollywood thought, “Gore” was the answer, but it wasn’t. It just cut into the profit made from snacks at the Theater. Hollywood has run out of options. They have remade the movies of past that scared audiences 50 years ago, but now make them yawn. Diabolical Plots is giving away one free copy of Shadows of the Emerald City. Do you want to enter? It’s very simple. All you have to do is reply to this topic and name your character from any Oz-related media. (That’s the land of Oz, not the OZ TV show). We’ll pick a winner at random from those who respond. You have until Monday 10/26/2009 at midnight CST to enter. If you’ve already paid for the special discount offer, then you can still enter–we’ll just refund your money if you win. 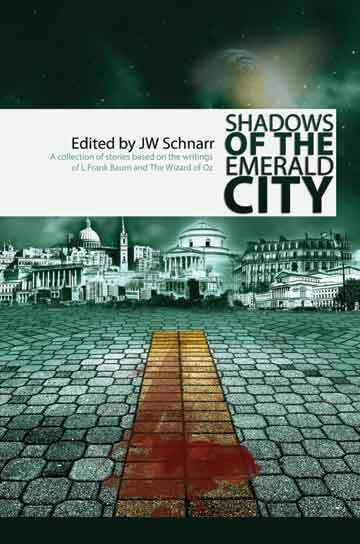 Special Offer in the works for Shadows of the Emerald City!